If you are already using the treadmill, you might as well use it right. 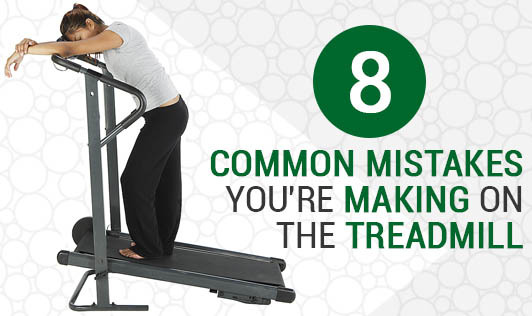 If you want to get the most of your treadmill minus the machine-induced pain and ache, avoid these major mistakes the next time you get on the treadmill. You increase the speed or incline too soon. Beginners should focus on time and not intensity. If you speed up or incline too quickly, you may feel intense pain in your calves, lower back, hips, or knees. Alternate between running and walking. By doing this, you will give your body time to adapt and this will help prevent pain during the workout. You compete with the person on the next treadmill. For all you know, you may be competing with an Olympic sprinter. So relax and don’t bother about what the person next to you is doing. Set your own goals and proceed at your own speed to avoid injuries and exhaustion. You don’t change your pace or you use pre-programmed workouts. Running or walking at the same pace doesn’t make your workout effective. Try alternating between walking and running. Increase your speed over time to keep yourself in the game. Pre-programmed workouts fail to push you to your limit. You workout at a 0% incline. Working out always at 0% incline will make the workout monotonous and less effective. Adding 1 to 3% inclination gradually, will stimulate outdoor running experience and make it more effective. You lean forward while running on the treadmill. You watch TV or read while running. While the entertainment options at your gym are many, they can also distract you from doing things that may need immediate attention like tying a shoelace which really needs to be tied. If you really need some kind of entertainment, just play your favorite music and match your workout with the beats. You only jog or walk on the treadmill. Instead of doing the same boring stuff, include new things like lunges or side-shuffling in your workout routine. You hold the handles of the treadmill. Holding onto handles, limits your range of motion and interferes with your natural pace. Therefore, try not to hold on to those handles.